Hawkins Pressure Cooker features an easy to lock and open function. This pressure cooker ensures a fair distribution of heat on the base.Enjoy cooking food in a short span of time with the Hawkins 5 Liter Aluminum Pressure Cooker. This cooker is made of high quality materials that ensure durability. 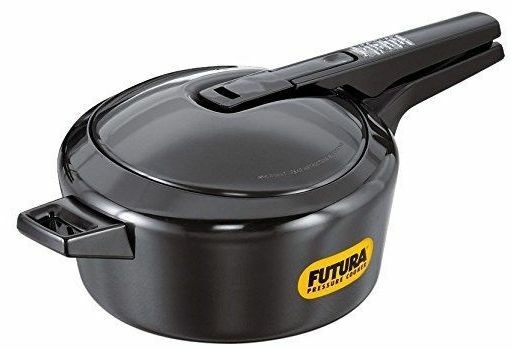 This cooker is made from aluminum and offers multiple safety factors. The base of this cooker provides a fair distribution of heat for easy and fast cooking. This pressure cooker is made of high quality materials that ensure durability. It features a 60 microns hard anodizing layer that lets the cooker absorb heat faster and be energy efficient. This cooker features an excess water vapor slot that maintains the steam inside and offers perfect results in a short time. It is characterized by multiple safety factors. This pressure cooker features an easy to lock and open function that offers hassle free use. You can cook healthy food in a short span of time. This pressure cooker ensures a fair distribution of heat that cooks food quickly and efficiently. It has a capacity of 5L that makes it ideal for large quantity cooking. This is very nice product very helpful in kitchen.